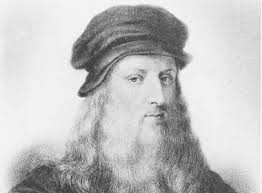 Leonardo da Vinci was born on April 15, 1452 and died on May 2, 1519. He was Italian. Different to a typical surname you might think of today, "da Vinci" simply means "of Vinci", the Tuscan town where he was born. Leonardo d Vinci is perhaps best known as a painter, with his legendary works including the Mona Lisa, the Vitruvian Man and the Last Supper, among others. His conceptual drawings included plans for musical instruments, war machines, calculators, boats and other ideas. Many of these plans were limited by the level of technology at the time. Flight was of particular interest to da Vinci. He studied the flight of birds and created plans for flying machines that resemble hang gliders and helicopters. Many of Leonardo da Vinci’s machines have since been built and tested, to varying levels of success. He became an expert in the anatomy of the human body, studying it in detail and creating hundreds of drawings to help explain his thoughts. The Vitruvian Man is a drawing by Leonardo da Vinci that describes the relationship between human proportions and geometry. Da Vinci wrote in the opposite direction to what is normal, meaning you’d need a mirror to read it properly. The Mona Lisa is perhaps the most well known painting in the world. It is a half-length portrait of a woman who, along with the composition, background and other details, has been the subject of much speculation and discussion. It is believed that Leonardo da Vinci began painting the Mona Lisa around 1503. It has been on permanent display at the Louvre Museum in Paris for over 200 years. In 1994 Microsoft founder Bill Gates purchased perhaps Leonardo da Vinci’s most famous scientific writings, the ‘Codex Leicester’. It contains explanations of water movement, fossils and the moon among other things. Famous Leonardo da Vinci quotes include: "He who thinks little, errs much." "Movement will cease before we are weary of being useful." "What is fair in men, passes away, but not so in art." "Drawing is based upon perspective, which is nothing else than a thorough knowledge of the function of the eye." "Good culture is born of a good disposition; and since the cause is more to be praised than the effect, I will rather praise a good disposition without culture, than good culture without the disposition." "I know that many will call this useless work." A work mate recommended me to your website. Thank you for the details.